Vinyl; Pro-Ject RM-5SE with Audio Tecnica AT440-MLa cartridge; Speedbox power supply; Creek Audio OBH-15; M-Audio Audiophile 192 Soundcard ; Adobe Audition at 32-bit float 96khz; clicks and pops removed with Click Repair, manually auditioned, and individually with Adobe Audition 3.0; resampled using iZotope RX 2 Advanced SRC and dithered with MBIT+ for 16-bit. Converted to FLAC and mp3 in either Trader’s Little Helper or dBPoweramp. Tags done with Foobar 2000 and Tag and Rename. 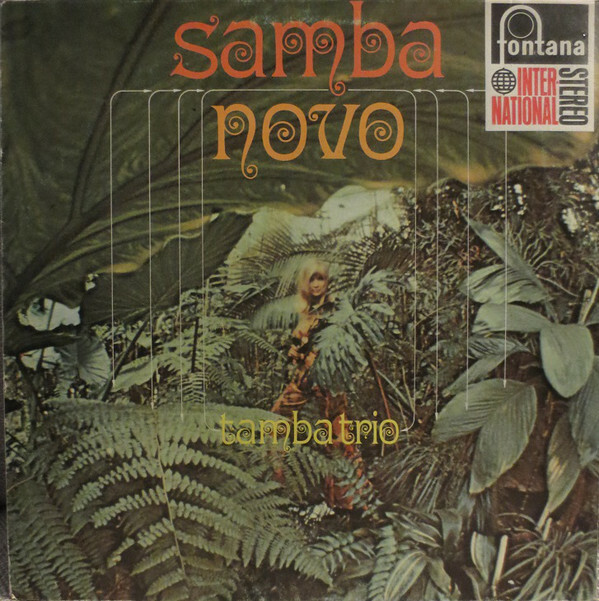 During North American jazzistas’ infatuation with bossa nova, one gets the feeling that U.S. drummers were paying close attention to how Brazilian drummers were integrating the complex rhythms of large percussion ensembles into a small combo setting, managing to effortlessly sound like some sort of hepcat eight-armed Hindu drum deity. Although I won’t place a wager on this, I feel like I can usually tell when a drummer on North American jazz records is not actually Brazilian (i.e. most of the time) – there are certain nuances in the syncopation and accents that even the best just weren’t able to wrap their heads around. Naturally there is a lot of cross-fertilization here too. At 33 years old, Hélcio was already a veteran, having played with bandleaders like Djalma Ferreira, studied with North American percussionist Henry Miller, toured Latin America with Ary Barroso’s orchestra and the United States with Luiz Bonfa. While in the US he also performed with Sammy Davis Jr. Around the time of this album, he had been studying music with Moacir Santos. I’m not really a music historian (I just play one on the internet) but I will make an assumption that Hélio incorporated some new techniques he picked up abroad interacting with North American musicians, like his incredible brush work. 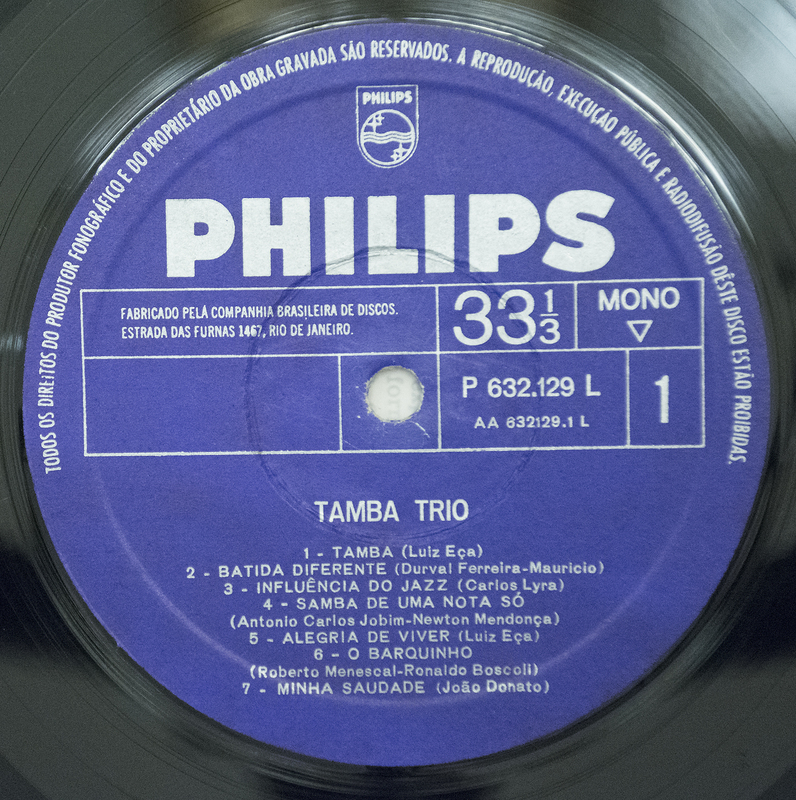 Hélcio stayed with this original incarnation of Tamba Trio just long enough to produce three great albums, then left as his career had him shuttling back and forth between the US and Brazil, occasionally joining his old compadres for records and tours. He also contributed soundtrack work for films by the vaunted Leon Hirzsman, Ruy Guerra, and Joaquim Pedro de Andrade. Original liner notes. Click to enlarge. The other members of the trio are no slouches either, of course. Luiz Eça, for all intents and purposes the leader of the group, is a revelation on the piano. I want to call him the Brazilian Horace Silver but I don’t really have a sophisticated argument to back that up. In any case he plays more ‘blue’ notes in that opening track than we’re accustomed to hear in Brazilian music. One of the qualities of this debut LP could also be a shortcoming from another point of view: all of its fourteen songs are under 3 minutes, and many of them under 2 (which is pretty punk rock of them – see how ahead of the curve they were?). So on the one hand, you’ll never be bored by a long-winded solo, on the other hand you might actually have a craving for some long-winded solos. At the very least I would have loved to hear Eça cut loose on some of these tunes. Of course I would love to hear Bebeto cut loose more on the flute as well, but he is already busy defying the laws of physics by being both the bassist and flautist. The liner notes enlighten us that this was achieved by the technological innovation of “playback,” otherwise known to us moderns as over-dubbing. Later on, Tamba Trio would become a quartet so that Bebeto could focus exclusively on being a reed man. Did I just use the word “modern”? It is an important word for this record. I know because producer Armando S. Pittigliani uses it about fifty times in his liner notes. The country had just emerged from president Juscelino Kubitschek’s promise of 50 years of modernization in 5, with progressive elements looking forward to the sweeping reforms of Goulart that threatened the elites enough to trigger a military intervention to “restore democracy”, with them ultimately deciding the people weren’t ready for democracy and it would simply have to wait another twenty or so years. The guys in Tamba Trio had been working together for several years by now, backing singers like Maysa and Leny Andrade since the beginnings of bossa nova. But when they christened themselves with a proper name, debuted under it at the venerable Bottle’s nightclub, and prepared to launch a career as one of the first “serious” instrumental ensembles (as opposed to instrumental music intended for dancing), they were also being positioned as musical ambassadors of Brazil’s modernity. The liner notes recount a rapid-fire mini-tour of New York, Minneapolis, and Chicago in the lead up to this record, and discuss plans to release the album in the United States, Argentina, France, and the Netherlands. This didn’t quite happen. Although the info at my disposal is probably not exhaustive, it appears that this record got a release in Mexico in ’66 (where there was a huge enclave of artists and intellectuals seeking respite from the military takeover of Brazil), with the promised Netherlands release coming only in 1968, where it got a completely different cover and track sequence (shown on the right). 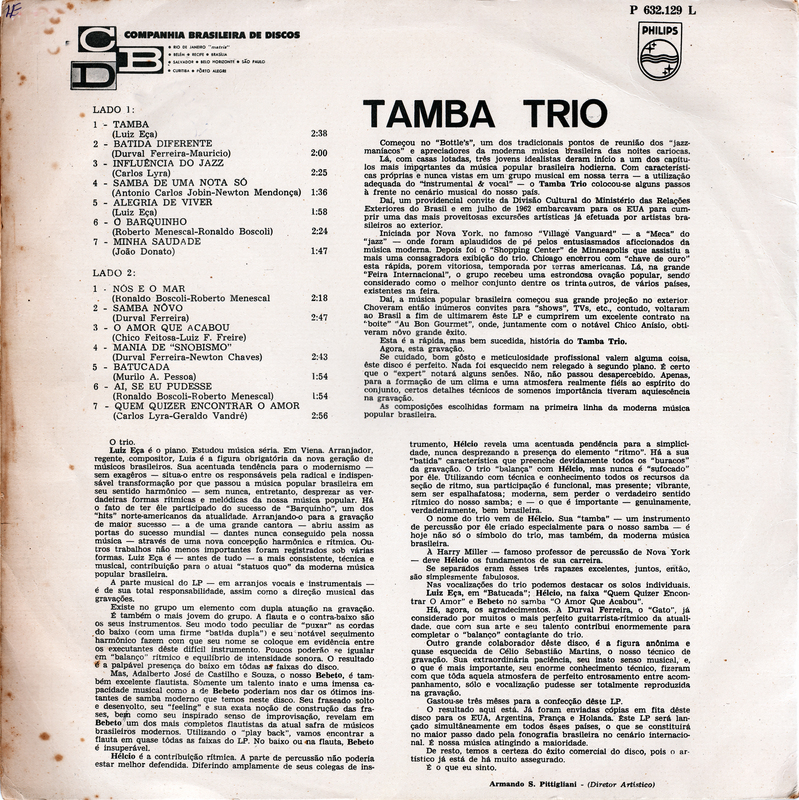 If the mood strikes me, I will probably be sharing the other two records from the original Tamba Trio before too much time elapses. They’re all good, but there is something especially fresh and original about this one that makes it really stand out. I hope you enjoy it. Beautiful stuff, nice rip and excellent writeup, thanks! Thanks Simon, always nice to see you drop in here! Nossa, Flabber, que beleza de disco! Sua gravação em alta resolução (24/96) está incrível! Como é bom ouvir “samba-jazz” em mono sem aquele exagero de compressão, equalização, redução de ruído e todas aquelas práticas criminosas que são comumente usadas nas remasterizações. Eu particularmente adoro esse período da música brasileira (de 1962 a 1965, mais ou menos). Discos como “O Som” (Meirelles e Os Copa 5), “É Samba Novo” (Édison Machado), “Impacto” (Hector Costita) e mesmo os três primeiros do Jorge Ben sempre me põem pra cima. Quem dera eu tivesse todos eles com a qualidade de som da sua gravação desse debut do Tamba Trio. Muitíssimo obrigado por essa joia, seu gosto musical é impecável, e seus “rips” em alta resolução são sempre um prazer de se ouvir.